Ranger with each of the spaceship skills. and one military skill area. Star Law was created during the First Sathar War as a counterintelligence agency, to check the Sathar espionage organization. After the war, when the Sathar retreated to lick their wounds, the number of enemy agents in the Frontier was reduced significantly; this left Star Law overstaffed. The United Planetary Federation (UPF) Security Council chose to take advantage of the situation by expanding the scope of Star Law.s responsibilities to include the control of marauding pirate bands that had arisen in the Sathar.s wake. At the present time, Star Law also intervenes in minor corporate skirmishes on occasion. One of the provisions for membership in the UPF is that Star Law be allowed to carry out its duties on member planets and their territorial possessions without interference from their governments. It must, however, obtain warrants to search private property in situations not covered by the .hot pursuit. exception. If the investigation of a suspected Sathar agent, escaped convict, or other lawbreaker threatens to turn into a gun battle in a densely populated area, Star Lawmen are trained not to fire upon the suspect if there are innocent beings about. Agents must follow the suspect to a deserted area or arrange for getting innocents out of the line of fire. Threats against fugitives (in hopes of making them surrender) are generally useless, as most lawbreakers are aware of the limitations placed upon Star Law personnel by the regulations of their organization. Freelance law enforcement (bounty hunting), without proper training and licensing, is not encouraged by Star Law. To obtain a bounty hunter's license, a character must have at least one 4th-level ranged-weapons skill. Bounties are almost never awarded for dead bodies; suspects must be brought to the proper authorities alive and relatively unharmed. Anyone with a bounty hunter's license may obtain a list of all beings wanted by Star Law and the rewards offered for their capture. Bounties are set by the referee. The rarity of treason cases recorded within Star Law is due to the intense screening of Academy applicants. Any disobedience of orders is dealt with swiftly. Severe disobedience results in the offending party being relieved of duty and court martialed (the results of which are decided by the referee). The Star Law Academy, located on Morgaine's World, offers one of the best educational programs in the Frontier Sector. In order to apply for admission, a being must complete a series of forms at a local Administrative-branch office and pass a personality check. The applicant must also have four ability traits higher than his or her racial average, and must never have been convicted of a criminal act. The applicant will be notified within two months of acceptance or rejection by the Academy, and must provide his own transportation there if accepted. Once at the Academy, the being must select a PSA, if he hasn't already done so, and make a Logic check. Failure to make the check indicates that the being has washed out of the Academy. After four years of study, the cadet gains one 1st-level spaceship-related skill, one 2ndlevel skill within his PSA, and one other 1st-level skill. All skills required in order to possess the spaceship-related skill chosen are also granted. After graduation, the being emerges at the lowest rank of his chosen branch, and is then posted on a planet of the referee's choice. The Star Law Rangers operate as an interstellar police force that "concentrates on finding Sathar agents, but also fights space pirates and other interstellar criminals." We also know that the Rangers have large territorial areas of authority because in the history section we find that Rangers "track the Sathar's agents from planet to planet and fight them on their own terms." The peace of the Frontier region is maintained in space by the UPF Spacefleet (see the Star Frontiers Knight Hawks game). We assume that actual authority in deep space is in the hands of the Spacefleet and not the Star Law. The defense of individual planets is the responsibility of their armies and militias. This is certainly true for civilized planets. Whether the armed forces are made up of volunteers, inductees, or mercenaries would depend upon the planetary government, its population and resources, etc. (in other words, the referee). It is safe to assume that matters of immediate local defense (riots, revolutions, massive pirate raids, etc.) usually fall under the authority of a planetary army and the space fleet it uses for orbital defense. Every large city will have its own police force to guard its citizenry and maintain law and order. Some planets might have police with wider territorial authority for counties, states, provinces, nations, or continents. Although the interstellar company most often referred to is the Pan-Galactic Corporation, it is only one of a half-dozen similar mega-corporations in the Frontier. It seems obvious that each mega-corp would want their own security force to guard their property and interests, to investigate industrial espionage, etc. No one mega-corp security force would be trusted by any other to always stay within its corporate authority. In addition to the above, innumerable other law enforcement agencies would be at work: high-tech mercenaries hired by rich individuals as body guards, private investigative firms licensed to operate locally or planet-wide, and so forth. As you might guess, the problem of interplanetary security is a big one. If the theft of a Pan-Galactic Executive Vice President's personal belongings occurred, it would bring in Pan-Galactic's Security Force, any private firms the VP had employed, and (if notified) all planetary authorities. If the felon were loose on the planet, that might bring in all planetary investigators authorized to keep local peace. If certain major crimes were committed during the robbery, say the theft of a government shuttle for a getaway, the armed forces might now be involved. However, if the fugitive leaves the planet and escapes into deep space, would the Spacefleet be involved? What happens if one of the possessions stolen was a device that would be of interest to a hostile alien race? Could a Port Loren beat cop try to arrest a Sathar in deep space? Obviously, there must be a law enforcement agency with far-reaching powers and jurisdiction that can work with different local agencies while transcending their limitations. This is the job of Star Law. The exact crimes and jurisdictional areas that Star Law would be involved with can be laid out by individual game referees. What is given here is a suggested organizational structure for Star Law. We hear a lot about the Rangers, a glamorous branch of Star Law, but in fact they are only one small part of a stellar agency dedicated to galactic peace. We know that Star Law Headquarters is located in the city of Port Loren on the planet Gran Quivera ("The Hub of the Frontier Sector") in the Prenglar system. We also know there is a Star Law base on Morgaine's World in the same system. Beyond this, we can create some "basic facts" as a foundation for Star Law. 1.A Star Law base exists on every civilized world of any size in the Frontier Sector. These bases range from large complexes to one-man offices, depending upon that world's needs. 2.Star Law itself does not own a great fleet of ships or an army of combat vehicles. Each base would probably have an array of fast, light armed vehicles for planetary and interplanetary transportation, such as flit-boards, rocket bikes, skimmers, etc. 3.Star Law would not have vast armies of combat personnel because the UPF and individual planetary governments would not want a powerful Star Law undermining their own powers and authority. Instead, Star Law would have numerous agents with wide-ranging authority who would not pose a threat to city or regional police forces or planetary armies. 4.Star Law personnel would have the power to call the UPF's attention to major transgressions by city or planetary governments, though they try to avoid matters arising from local politics. They can get military assistance from Spacefleet or other authorities if deemed necessary by the UPF Security Council. An individual Star Law agent's firepower would be impressive since he must often uphold the law when working with few allies. An average Star Law mission team would include 2-6 members. 5.Any ventures beyond the Frontier "on the Rim" (as the unexplored and possibly dangerous systems are called) or into alien space (neutral or enemy) would be officially undertaken by Star Law. Any unofficial ventures would be made by mercenaries, bounty hunters, etc. 6.Residents of the Frontier Sector who are not of the four main races but who have clean records and initiative might also be Star Law officers. Indeed, when dealing with the Rim, they might be more desirable as agents than one of the major races. 7.All investigations of known hostile races (Sathar, Mechanons, Zuraqqor, etc.) would be made under the authority of Star Law. A Star Law agent's authority level would be very great in this area. 8.Investigations dealing with possible crimes committed by Star Law personnel would be handled by a special branch of Star Law Internal Affairs that answers only to the UPF Security Council. 9.All investigations of other established security forces (Spacefleet, world armies, etc.) or interplanetary governing bodies (such as the United Planetary Federation) would be handled by special investigation committees appointed by the Star Law Captain-General. 10.Under article 15 of the Securities Act, a Star Lawman of Ranger rank or above may commandeer any ship, private or UPF-owned, not engaged in an active defense of UPF space for the purposes of pursuing enemy agents in or out of the Frontier. 11.Under article 12 of the Securities Act, a Star Lawman of any rank can impose Stellar Law in a city, county, or continent if he deems it necessary to maintain civil obedience. 12.Under article 13 of the Securities Act, a Star Lawman of Ranger rank or above may also impose Stellar Law on an entire planet if he deems if necessary to maintain civil obedience. 13.Under article 14 of the Securities Act, the Star Law Captain-General may impose Stellar Law on an entire system if he deems it necessary to maintain civil obedience or UPF security. Only the UPF Security Council can declare Stellar Law on the entire Frontier. 14.Star Law retains its authorities during both peacetime and wartime. 1.The authority to detain, pursue, and warn or arrest anyone within their jurisdiction who breaks the law. The decision to warn or arrest is at the Star Lawman's discretion and dependent upon such factors as past record, severity of crime (speeding vs. possession of a weapon), attitude of lawbreaker, etc. 2.The authority to commandeer any vehicle and pilot it, or cause it to be piloted, in excess of normal legal regulations, in an attempt to fulfill section 1. This authority does not include any overt actions that unnecessarily threaten society. 3.The authority to search a premises in an attempt to fulfill section 1 if due cause exists. In those cases where Star Law Command can be contacted immediately for confirmation, such must be obtained. 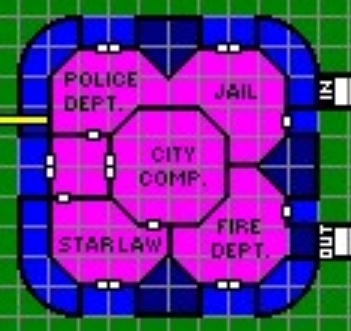 In those cases where Star Law Command is more than ten minutes communications distance away and the Star Lawman decides that this wait is to the detriment of or dangerous to society, the Star Lawman may gain access to the premises in any fashion possible. In cases where a Star Lawman is in pursuit of a criminal or lawbreaker or is witness to a criminal act, then the Star Lawman may gain access to the premises in any fashion possible. 4.The authority to protect society, himself, or private property (in that order), whether in an attempt to fulfill section 1 or in the normal course of his activities, by whatever means necessary excluding measures which may be more harmful than that which is threatening society, himself, or private property. Obviously, the Star Lawmen have a much greater level of authority than normal law enforcement agents, but they also have a much greater responsibility. Because of this, the screening of Star Law applicants is incredibly detailed and thorough, and includes Telol injections, psychoprobes, and rigorous indoctrination. In the entire history of Star Law (127 years), there has never been a recorded instance of a "bad apple" getting through the screening, though some Lawmen have gone bad after years of stress and exposure to the criminal element. To placate an always suspicious public, recent innovations such as the file computer and recorder helmet have been introduced into the Star Law ranks, especially among Lawmen working in highly dangerous or urban areas. The file computer is a specialized computer that does nothing but record information verbally fed into it by a Star Lawman. These 15 cm. square devices are then tied into Star Law's mainframe computers at the end of every shift, and their info is dumped into the general information pool. Star Lawmen thus create a running account of their own activities, an open "file" on various suspects, and recordings of eyewitness accounts and testimonies. The info-pool contains a vast wealth of current information that can be made available whenever it is needed to Star Lawmen only. A recorder helmet operates in much the same way and even has a file computer built into it, but also has a tiny visual scanner/recorder built into it that can record the case visually as well. The helmet can either be broadcast to a local recording facility or use micro-disks in the built-in recorder to store the images. A Star Lawman under the rank of Ranger can be called off a case or have his case closed by either a personal directive or general reassignment, both issued by Star Law Headquarters. Star Law Rangers can only have their cases closed or be reassigned by personal directive from Star Law HQ. Star Law Marshals cannot have their cases closed, but can be reassigned, but only by the Star Law Captain-General, and then another Star Lawman of equal or higher rank must take over their cases. Star Law Commanders cannot be reassigned or have their cases closed, but they can be recalled by the Star Law Captain-General for briefing or debriefing. Star Law Commanders can be forcibly retired, but another Star Law Commander must take over the case, and the entire casefile and official actions ordered are reported to the Security Council to prevent any cover-ups.